It was sarcasm, Dr M says. Malaysiakini has published the first part of its interview with Mukhriz's father. "In recent weeks, the opposition has been showing a video-clip at their ceramah where Mahathir was depicted to have conceded in a comical tone that he had brutally mistreated his then deputy, Anwar Ibrahim. “I mean any stupid fool would have seen that it was a sarcastic remark made by me but they (opposition) make use of such things and this convince voters that they are not really knowledgeable about things or they are not very sophisticated in the use of the media,” he said." But the former PM wasn't joking when he told Soon Li Tsin that Malaysia needs a strong Opposition. Read the full interview, plus his assessment on how Pas, DAP and PKR would do in Kelantan, Penang and elsewhere, here. who the hell is this soon li tsin? can't the paper show any respect by sending a more reputable journalist instead of a no one?? we're talking about the former PM la..not some char kuey teow seller. looks like even the so called alternative media has gone to the dogs! a journalist is only as good as her last byline, and li tsin's latest one isn't bad at all. Well, I don't see why you would jump onto it as if that changes the mindset of anyone unless you believed in the story from 1998. For the overwhelming majority of Malaysians who politically might not agree with Anwar at the same time, they believe that Anwar was wronged. This was the gist of what Mahatir said and no body asked him about it. And why would he be sarcastic and then lament that he is oppressed today? No. Mahatir never seeks forgiveness. He is proud. Only that, that pride has been his very under-doing when he was in power and now when in the cold neglected like a former councillor. In fact, Anwar pulls more crowd than he can. Mahatir shouldn’t disturb himself as to whom we should choose. He is responsible for our woes, destroyed our fabric, killed criticism when he was I n power. Bodohwi only perfected it. So why is he saying he regrets anointing Abdullah? You seem utterly disturbed that Mahatir admits his brutal tendencies and that’s why you are making an impromptu entry in bolstering the rants of this senile man. I tell you the malaise of Malaysia is Mahatir. His past if for us to judge him, not for him to try to play with his words. He is remorseful but doesn’t have the moral strength to come out and speak the truth. As a Chinese who has no interest in the political wars of Mahatir or his detractors, I believe that whether Mahatir the fox makes maneuvering statements, the fact remains his legacy is contested. And I hate when he blames the current leadership. Wasn’t he the one who imposed it upon us? In his temerity, he says Najib is excellent; may be excellent in Keris waving and Chinese bashing and other escapades. I’m shocked that you are in a very early campaign for Najib and even had the audacity to suggest that Mukhriz will be his running mate. Well, Najib is not running today, but the Chinese are not ready for his calibre. You can have that in advance. You wrote: "Malaysiakini has published the first part of its interview with Mukhriz's father. Is Mukhriz alone his child? Why did you pick him alone? yes, you endorsed him for Jerlun in your own capacity as an individual, but I beleive you are going overboard in conducting this Mukhriz selling spree. Unless, you Khairy has approved that, so that Mukhriz is cut into size. Even Mahatir is worried. That's life. Nothing is parmanent. The mighty of yesterday becomes less powerful than Zakaria of Istana Zakaria. Life is short and meaningless indeed. I'm reminded of that. I wish Mukhriz all the best. Mahatir the same and the same. Leaving the innuendo game of the slanderes, do you mean Mahatir didn't brutally mishandle Anwar? Even if we say Anwar committed the crime he was accused of, do you think the senseless beating that he was subjected to, the shoddy court work, the media character aasasination blitz were not brutal? I beleive you can do better than Rocky. I'm taken back by your new found world view and moralism. No wonder the man Tun is blaming for running down the nation is good in leraning the ropes of Mahatir. Tun cries that Kalimullah is suppressing the media, I wish you have done better yesterday but that's water under the bridge. A day will come when Bodohwi will undergo the same treatement. Anyway, differentiate between the slanderous claims and the brutal manhandling of Anwar. It is simply amazing how someone who was deemed “irrelevant” by the caretaker PM and of whom the mainstream media (MSM) chose to send into oblivion has now become the cover story of the MSM – for very obvious reasons of course! “Who is Anwar? ” the PM had asked sarcastically. He is finished. His political career has folded up. But now, almost every other day Pak Lah answers his own question! Anwar’s “spirit” haunts, hounds and heckles him – even though Anwar is not eligible to stand! Very evidently the script and sandiwara for the General Elections by the boys on the Fourth Floor have spun out of control. The sycophants surrounding the PM have been caught with their pants down. In comes an eminent human rights advocate who would spew out an “intellectual” diatribe – Chandra Muzaffar – a man whom in elections of recent times (except when he was in the Opposition) the BN would unleash before the final curtain. “If Datuk Seri Anwar Ibrahim becomes Prime Minister, it will be an ‘unmitigated disaster’ for Malaysia. . . he is not the sort of leader the country needs as he is now singing a different tune from when he was in the Government, ” charged Chandra, the former deputy president of PKR. “On what basis did Chandra join PKR as deputy president given that he had reservations over Anwar’s past decisions? ” he quite appropriately asked. “Now, on the eve of the elections, he seemingly dismisses the opposition and asserts that, despite its flaws, there is no other viable coalition beyond the BN. How fortuitous. I guess when you’ve been offered a cushy position in a state university for two years, you tend to ‘change’ somewhat. “Dear Chandra, selling out is fine. But becoming a willing tool of a corrupt, arrogant and racist regime at this critical juncture devalues, indeed destroys, whatever good work you may have done thus far. May God guide you, ” was Mikhail’s parting blessing! In other words, it appears Chandra is also singing a different tune? “Such an argument only raises further questions: in the first place, isn’t the increase in polarisation due to ethnic-based policies and practices of the past Umno-led administrations, as alluded to by Chandra himself? If so, how on earth could Umno be relied upon to make meaningful changes that could redress problems related to ethnicity and religion? “And why was there an emergence of amorphous groups such as Hindraf that articulate legitimate grievances (to a large extent) from a particular ethnic community? Chandra also said “the most important quality of a leader in a multi-ethnic country was honesty and when a leader spoke on sensitive ethnic issues, he must say the same thing to non-Malays as to the Malays…You cannot play games because it is very dangerous. " There could be no better response to this than that provided by the Malaysian Media Monitors’ Diary: ”If, as rightly pointed out by Chandra, the issue of trust and honesty is vital, then shouldn’t we, or rather forum moderator Wong Chun Wai, also ask whether leaders such as keris-wielding Hishamuddin can be trusted to be one of the country’s leaders. “After all, didn’t Hishamuddin change his political stance pertaining to the issue of Chinese and Tamil schools in the country in the run-up to the general election? Isn’t that political expedience of the highest degree? Yes, what about the “honesty” of caretaker deputy prime minister Najib Tun Razak who in 1987, as UMNO Youth Chief, vowed to bathe the keris with Chinese blood, and who now never fails to spew out a verbal diarrhea of multi-racial mutterings? As for consistency, did the caretaker PM not preach to the gathering of Christians at the Plenary Commission on Faith and Order of the World Council of Churches at the beginning of his premiership on “Dialogue The Key To Unity Of Multireligious, Multiethnic And Multicultural Societies” and yet, four years later ban the Building Bridges Conference, a inter-religious seminar meant to bring together Christian and Muslim scholars of international repute? Anwar was referring to the October 1987 Umno Youth-led demonstration in Kuala Lumpur where a band of Malay leaders, including present Deputy Prime Minister Najib Razak, harangued the crowd with inflammatory rhetoric. At that time, the posting of non-Mandarin speaking administrators to government-aided Chinese schools ratcheted up racial tension in the country: “Those were fraught times and I hold that the distinction one ought to make between a responsible and a chauvinistic leader in that context lay in how you argued your point without inflaming public sentiment. “I stood on the sane side of that divide while there were others in power today who breached that line with impunity, ” he said. In early February this year, Anwar subjected himself to a rigorous examination of his stances on religious issues in the presence of about 200 Christian clerics and lay activists and appeared to have emerged intact (Malaysiakini). There was no variance between his public pronouncements and his private assurances to his inquisitors, said an observer at the closed-door dialogue held in Petaling Jaya, organised by the Christian Federation of Malaysia. By portraying Anwar as untrustworthy and unprincipled Chandra is pronouncing the “death sentence” on the man who has already paid a very costly price for challenging the head of a hegemony who was capable of the most heinous! Asked why he was breaking his silence now, Chandra said it appeared that people were being deceived by Anwar and (i)t is something for which I am prepared to go on record now so that people will not be deceived". Apparently Aliran was not satisfied with the answer given by its former president and so it stated and asked: “The most disturbing aspect of this episode is how Dr Chandra Muzaffar has wittingly or unwittingly lent himself to be a part of the BN propaganda machine. It is sad that a prominent intellectual and long-time activist of his standing has such a blinkered view of the issue at hand. We wonder why he did not make these alleged goings-on public earlier and follow up on them conclusively given his public stance on integrity and accountability. Why only now? " Alas, Chandra should not allow himself to be a hydra of the BN! I think Mr Wong of 2.14am may have his point you may wish to ponder. Try to remain independent from both BN and BR, as far as you can... you may be able to sustain your crowd too, all you know. You definitely can do it! Mahathir says we need a strong Opposition so let us vote for the OPPOSITION - in fact let's give them the mandate to rule the land for the next 5 years and see how they perform. With BN we already know what the outcome is like. Wong, the kris bashing antics was by Hishamuddin, not Najib. When amno people talks about 'negative' views of amno, we should believe it! Linggam : "Looks like me, sounds like me but...."
Mahathir : "Even stupid fools would know it was sarcasm....."
He even insulted his own supporters. So the opposition are smart people after all! Mahathir, remember what goes around comes around. 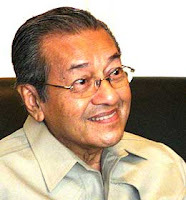 Mahathir the same and the same. The good ol' doctor is the greatest fool of all as he tried to depict himself the wise guy. In this hour of desperation to rid the country of a corrupt and sick regime, the country does not need his shallow opinion, as we all need to learn to undo and disabuse ourselves of the mental damage he had done to the citizenry. In fact he is solely to blame for the ills and corruption in this godforsken Bolehland country. It will take at least 2 generations to undo the damage, and Mahathir be damned for the scorched earth we inherited from his legacy. Good riddance to his kind and yet he wants to put his son in place. Bah! I find it disgusting that Mahathir can patronize people and gleefully said that we are fools into not realizing that he was being sarcastic about his admission on Anwar. Of course we know that he was being sarcastic -- which makes it even doubly detestable that he can trivialize the whole Anwar episode into a joke! Where are his manners, rather, his humanity? Sarcasm or no sarcasm, sorry but the damage is done. I wonder if Mahathir realizes that we are enjoying his comedy while it lasts. And if his rantings do help in this election campaign, let him have his say, let him have his last sigh, his cry for redemption. He has gone bananas. if you dunno who li tsin is, i think it reflects more on you than on the mainstream media. and if you had taken the time to find out, you would be aware that they sent a whole team, but LT did all the write-up work. so chillaxla, find something more productive to say.